Remember the courses I applied to in May? No? They are Swedish A and Multimedial Webbproduction. I have been approved! Both of them! It is going to be one busy fall. Now I can apply for student loan and hopefully they will approve that application too. We went to a friend's 30th birthday party on firday. It was a potluck party where everyone brought something. I made a salad that is really easy and quick to make and even easier to modify to your tastes. Make the sauce first: pour the sour cream to a bowl, peel and press the garlic into the sour cream and season with salt. It should taste salty because the amount is for the whole salad. Lay the sauce aside and let it season while you prepare the vegetables. Don't like garlic? Add dill to the sauce instead. Rip the isberg leaves to a bowl, cut the pepper, cucumber and tomatoes any way you like. Dice them, slice them it doesn't matter. I like them chunky so that's how I cut them. Pour the sauce on top and mix well. Voilà! a super easy summer salad. If I want to beef it up I add diced ham and grated cheese or halved meatballs or some chicken bits or diced sausage or... You get the idea, you can add whatver you want. Experiment. After we had been eating, grilling and partying for a while, a bunch of people showed up. 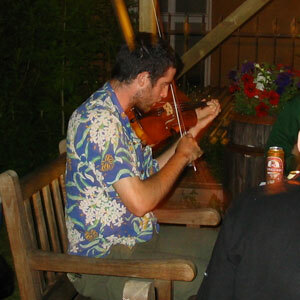 Among them was a young American from Seattle who was traveling in Europe playing fiddle. He played for us and he was amazing! He played some gypsy, Irish and classical music. After one fabulous piece he was asked what he had just played, he said: 'Oh, I just improvised.' You could hear jaws dropping, he was that good.